As part of our series focusing on mental health, Danusia Osiowy spoke to Claire Worden about her experiences, and why she decided to launch the NFYFC campaign, Rural+. The experience of nearly losing her father to depression inspired Claire Worden to launch a campaign to support young people working and living in agriculture. 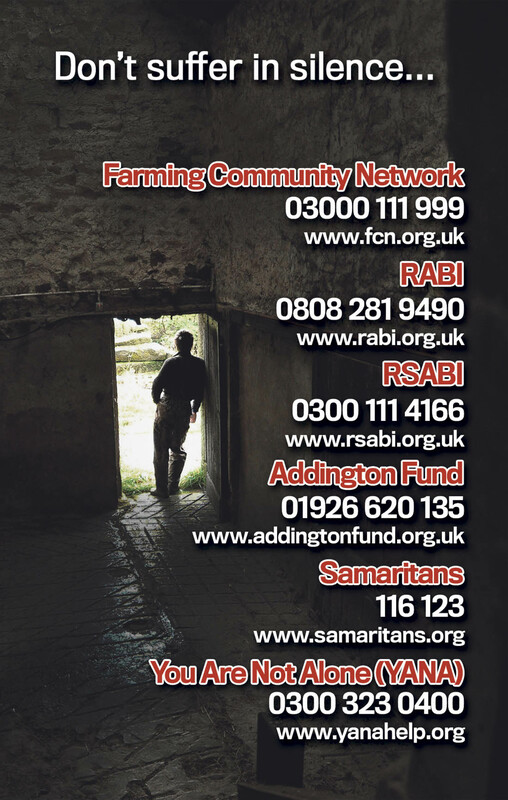 Depression is a topic which has been spoken about often during the last 18 months throughout the National Federation of Young Farmers Clubs (NFYFC), to its 25,000-strong membership. Spearheading the campaign was former NFYFC chairman Claire Worden, who was affected by mental health issues when her father attempted suicide two years ago. Claire's family were farming at Cardinham, near Bodmin, when they were hit with foot-and-mouth and forced to sell up. Claire's father had many successful years working for other companies, but still struggled over the loss of the farm. "It was devastating when foot-and-mouth came and I remember the difficult decision my family had to make. "My dad, being such a proud person, never came to terms with working for someone else. His pride did not allow him to open up and talk to any of us. "He always had a happy cheerful smile and a joke for everyone within the local community and everyone spoke highly of him. "What none of us realised was it was a happy front he was putting on and actually behind closed doors, he was struggling to see himself as a success. "This was until he made an attempt on his life. "It was a shock and came out of the blue. "Luckily, he was not successful with his attempt, and now is still recovering from his injuries three years on. He is, however, much happier now and opens up and speaks more often, as do more and more within the local community, which is a big positive. "I know from the rural community how proud and strong farmers are and how they do not like showing feelings as they perceive this to be a sign of weakness. "People in the older generation are very stuck in their ways, but I want them to realise, as a younger person having to watch an older close family member struggle is very hand and made much harder if the person refuses to share their concerns. "The reason for Rural+ was I wanted the younger generation to start opening up and smash the stigma of mental health away. I was very lucky and humbled to have a fantastic YFC community around me when my dad made an attempt on his life. They had no concerns in listening to my thoughts and were always on-hand to offer support. "When disease hits, or a natural disaster such as flooding or extreme snow as seen in recent years, it is never necessarily at the time when there is an unseen problem. "Depression can take many years to manifest into something which can have a real effect." Determined to tackle the mental health taboo, NFYFC joined forced with Farm Community Network and YoungMinds charities to raise awareness of the signs and symptoms associated with mental health issues and where members could go for help, all done through a variety of NFYFC projects. Since its launch, the campaign has gained wide recognition and every member has been given a wallet-sized card to signpost anyone they know to get help if required. Through Twitter, using #RuralPlus, the campaign has also reached more than 3.5 million users, thanks to a tweet from the Prime Minister when Claire won her point of light award for how effective the campaign was in relating to young people and tackling the important issues. Talking therapies can help with depression and are available both through the NHS and through private appointment. Cognitive behavioural therapy (CBT) addresses the way we think and how these thoughts can cause depression. It teaches skills to identify patterns of behaviour and adopt pro-active strategies to reverse negative thoughts. About half of people who experience depression will also experience anxiety. Taking steps to manage your anxiety can help give you the mental space to begin to deal with your depression. Some people, especially those with mild depression, find relaxation techniques, such as massage and yoga, help them manage their anxiety. Contrary to belief, medication is not always the first treatment prescribed, although there are a number of different antidepressant tablets available. What a GP will advise depends on the type and severity of the depression. Finding the right medication can be a trial and error situation and if one does not work, another may be prescribed. Psychotherapy can be more intensive than counselling, although professionals often use these terms interchangeably. It often looks at how past experience may be affecting the present, so may involve delving deeply into early experiences and key relationships. This may take more time, although shorter, more focused ways of doing this have also been developed. Research suggests exercise can lift a mood, because it takes the mind off depression while stimulating the release of endorphins in the brain which produce feelings of happiness. As with anything, there are recommended amounts, but what is important is it fits into your daily life and can be enjoyed. If you feel depressed, it can be difficult to be sociable. Loneliness may make you feel worse, so keeping in touch with family and friends and allowing them to be around you will help to reduce feelings of isolation.